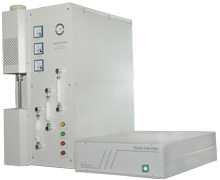 High-frequency Infrared Carbon & Sulfur Analyzer—CS-188 is composed of high-frequency combustion part and infrared detection part, featuring high conversion efficiency, high reliability, high stability, easy maintenance, and easy operation. Ultramicropore stainless steel filter which is ant-corrosion and no need of cleaning after long-term use. This system can store 10 carbon curves and 10 sulfur curves mostly. Self-defined curves can also be set by users. Unique temperature, pressure, flow, and width compensation method ensure precise detection. High precise balance (CS-188：accurate to 0.0001 ), auto identification of Sartorius, Shanghai, METTLER TOLEDO, and HOAUS balances.